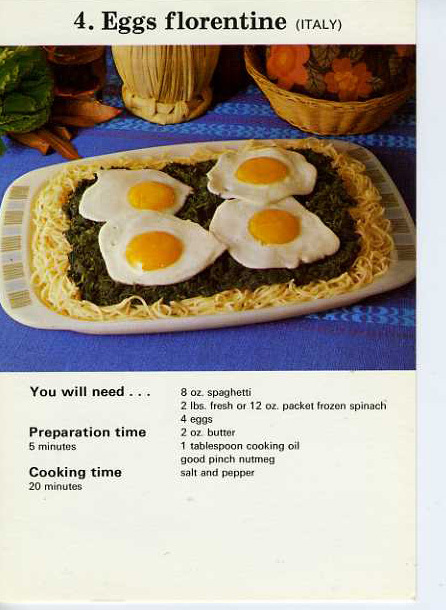 You will, dear reader, then understand my surprise when I saw the picture card of “Eggs Florentine (Italy)” posted by the VCBT: a plate of spinach on a bed of spaghetti covered by four fried eggs, looking distinctly un-eggflorentinish. Very confusing thoughts entered my brain, which is quite unorganised at the best of times: Why is this called “Egg Florentine (Italy)”? Where is the Hollandaise? How bland does the ingredient list suggest this dish will be? Why, during my many travels to Italy, and visits to the numerous Italian restaurants in my home town have I never ever seen this dish*? But, most importantly of all, how are you supposed to EAT this? Skewer your fork through the egg & spinach into the pasta and twirl in the hope that the egg might break up into bite-sized chunks? Twirl spaghetti and spinach around the fork & grow a third hand to cut the eggs? Cut up the egg beforehand and manoeuvre bits of it onto the spaghetti-clad fork? It is this latter question that prompted me to try the recipe. I just had to find out. And if it really was as bland as the ingredients list suggested. Rather naively, I asked Alix for the complete card, thinking there was a hidden twist in the instructions that might make this dish slightly more exiting. But no – there wasn’t one. It was in this instance really as easy ABC – boil pasta, prepare spinach, make eggs, combine (ok, that’s technically a D, but we’ll let them get away with it). The card also lacked instructions on how to ingest this meal, which would not have been out of place in a recipe card that instructs you how to boil pasta. I did have another reason for trying out this recipe: my relationship with fried eggs is a bit like Elly’s and meringue – it usually ends in a bit of a mess, with the difference that Elly’s meringues still look and are edible. My fried eggs, on the other hand, usually look like something that our cat’s dragged in through our bramble- and fox-poo littered garden: they’re brown and shredded. This is either because I never use enough oil or fat, or because our non-stick frying pans can only and charitably be described as non-stick in as much as that they will not stick to said cat if you’d throw one at him because he dragged something in that you could easily mistake for my fried eggs. However, the arrival of a new flatmate with staff discount at Selfridges changed all that – we now have a proper, true, non-stick frying pan with the Teflon-like characteristics of a prize politician. This might not last very long (my flatmate, methinks, is a tad naïve to let all eight of us use it…), so I grabbed it while it still does what it says on the tin, if only to see if I could produce decent fried eggs with the appropriate equipment. So, last Saturday, being a bit in a rush to cook something edible before Doctor Who starts, and apparently out of nearly everything to make an interesting meal, I thought this would be the perfect thing as it’s simple and quick. I decided to embellish the recipe from the beginning – I mean, they don’t even add salt to the spinach or the eggs. Surely, salt isn’t an exotic condiment, even in the blandness that characterises British 70s cooking? I cooked it as per instructions, using frozen spinach, an only slightly wrinkled garlic clove, parmesan and some near-expiry date crème fraiche. The (for me) tricky part of producing fried eggs that are deserving of the name went without a hitch – Teflon be praised! The results actually resembled those on the picture card! Now, to answer the burning question: how to eat this Italian trifle? Well, the only way they knew how back in the day when Spaghetti were considered to be exotic food: I took knife and fork to pasta to get all three ingredients on my fork at the same time. 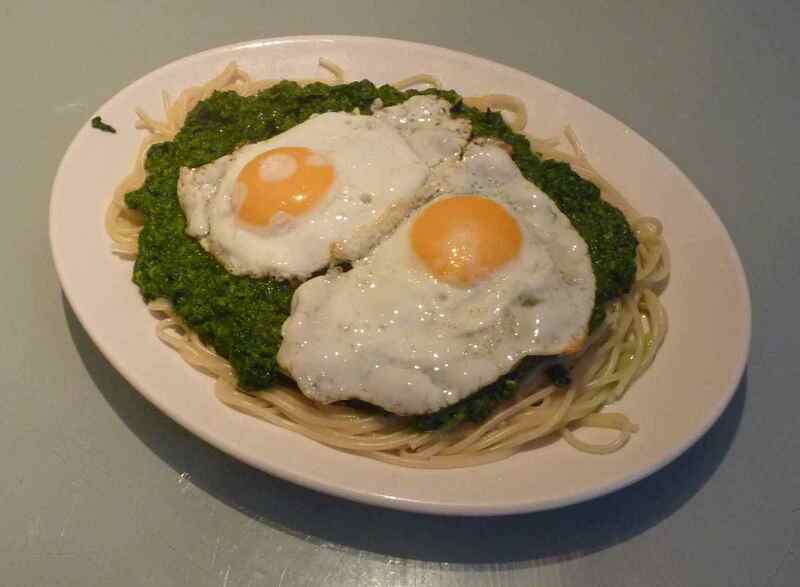 That way, the egg yolks mixes quite nicely with the spinach and the spaghetti, although it is a very sloppy affair. Good thing too that Doctor Who was quite boring, so I could concentrate on not dribbling spinach on my shirt. Despite my efforts to spice it up, it tasted still rather unexciting, although I’m sure that can be rectified by addition of more things to the spinach. All in all, a quick dish with a bit of a novelty look to it. But I prefer my eggs Florentine with more saturated fat. * I should point out here that in Munich, where I’m from, Italian restaurants are a pound a penny and very many of them are excellent and provide the real deal. None of them ever put Eggs Florentine (Italy) on their menu. 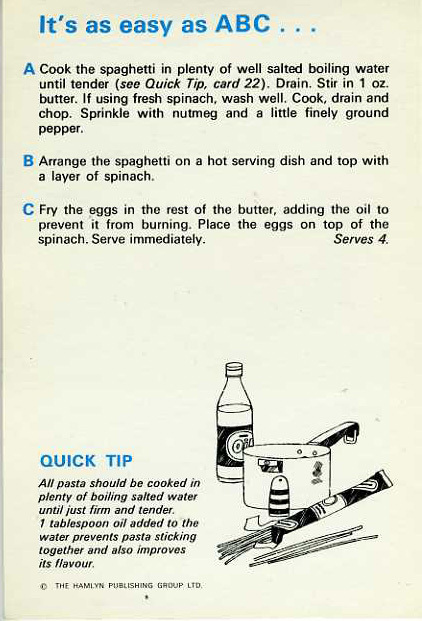 This entry was posted in 1970s and tagged butter, egg, nutmeg, pasta, vegetable oil. Bookmark the permalink. ‘Florentine’ is an old catering term that means spinach features in a dish with other ingredients; Lyonnaise means the same for onions, and I’m sure there are countless others. Food historians will know the origins of such terminology. Would it be inappropriate to tell you that you have nice fried eggs? Loved this post. Hilarious and helped temporarily suspend my constant cravings for Hollandaise! Just found Barbara Hammond’s instructions for proving a frying pan (pre-Teflon, it, theoretically, makes the pan non-stick). I have done this and it does work, though may take more than one ‘proving’. Also, beware of scouring – once it’s right – as it creates myriad scratches in the surface and you’ll be back to square one. I rinse the pan in very hot water (no detergent) and gently rub off any bits.